The only flat part is the water. The truth, as spoken by the lovely little old lady who handed me my packet at athlete check in at the Ironman 70.3 St-George. Goal: Eat decently. Hydrate. Try not to stop too often to pee. We left Vancouver Wednesday AM and busted south, Thelma-and-Louise style (without the felonies) for St-George, Utah. We were alternately chatty, giddy and silent. 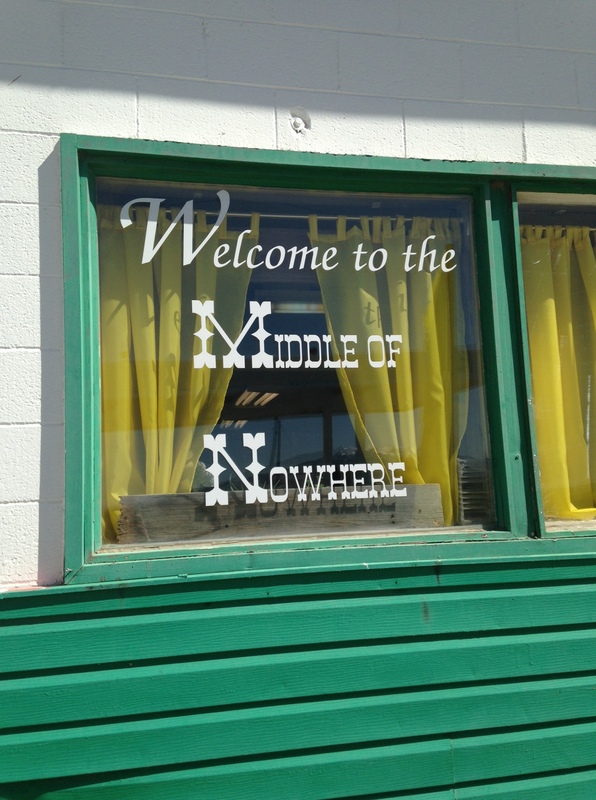 We passed through cities, tiny towns, giant wind farms and vast expanses of nothing. Our butts went numb. We confirmed that satellite radio is highly repetitive (first world problem). It was so great to finally pull into our hotel to find that it had a pool and that it was a cracking 34C. I immediately started worrying about getting sunburned. And with good reason – my pasty self burned within 10 minutes on day 1 during our shake out jog. Goal: Wake up perky and ready to smash it. 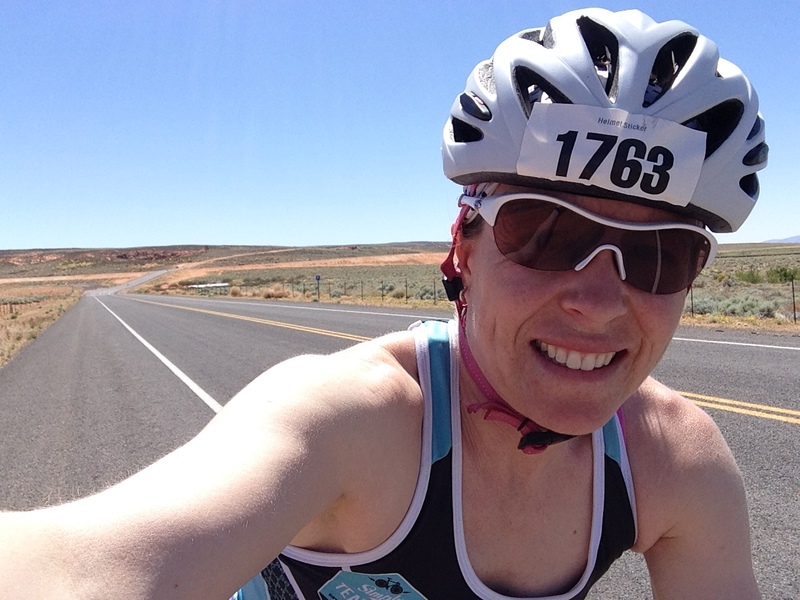 Reality: Woke up grumbling about how much I hate triathlon. There’s nothing fun about a 4AM wake up call. It doesn’t matter how early you go to bed the night before. We choked down breakfast and hopped on the buses bound for the start line by 5:20AM. Since my wave didn’t start until 7:45AM, this meant that I had a solid 1.5h to fret and apply 17 layers of sunscreen. Several people felt it important to point out to me that I was pretty pale and should apply sunscreen. Thank you for stating the obvious. However, no one offered to do my back. Sigh. Luckily, I had Bobby to hang out and ogle the pros with. 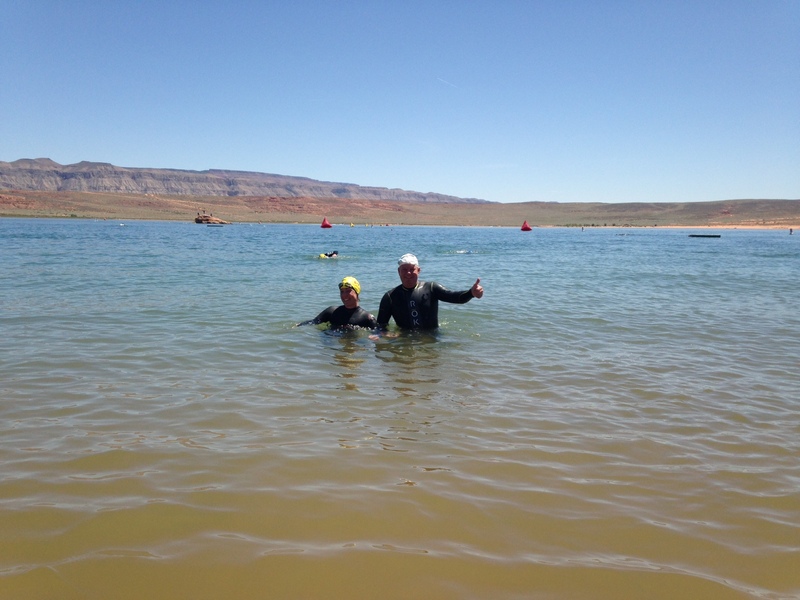 Finally, it was time to wander to the start at Sand Hollow and pee in my wetsuit. Wait, what? I didn’t do that. Pssh. Goal: Avoid drowning. Swim under 40 minutes. Aim for a straight line and good sight lines. Reality: Didn’t Drown. Swam 37 and change. I think I swam a pretty straight line. Punched some poor guy in the face. So much for perfect sighting. Definitely need to work on focus and tempo in the water, but considering how much I’ve been swimming and how scared I used to be of open water swimming, I’ll take it. And my feet and hands didn’t freeze off! I was surprised by how many people I caught and swam through and how many people were clinging to crafts and/or backstroking. Goal: Don’t crash. Ride 2:45. Pass everyone who swam by me. Don’t get a sunburn. Reality: Didn’t crash. Rode 3:02. Passed a whole lot of people, especially on the climbs. Do you see now that I mean about the pasty?! In the lead up to this race, everyone was talking about how hard this ride was, all the hills, oh my god the hills, have you seen the hills? THE HILLS! THE HILLS! We decided not to drive the course because hey, you don’t know what you don’t know. As I was waiting for my swim start, I saw Keats who works for Ironman. His tip? Watch out for cows at mile 5. So that’s what I did — instead of focusing on getting settled in for the ride and finding my race pace, I spent the first 5 miles looking for cows. Then I’m pretty sure I spent the next 51 miles looking at the scenery, fidgeting and contemplating my navel. I had the focus level of a fruit fly. I was very happy that I was able to set aside my vanity and decided that instead of racing in my fancy SOAS ambassador kit, I went all white and covered my arms. Smartest thing I did all day as I think it prevented me from turning into a piece of bacon. 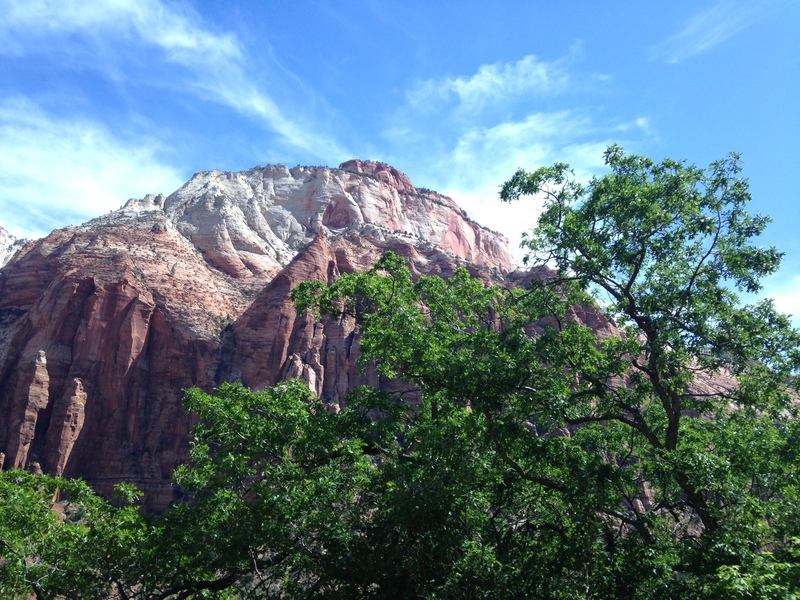 I finally zoned in around the infamous Snow Canyon – the climb everyone had been panicking about. In all my years of racing, I’ve never seen anyone walk their bike mid-race, so this was pretty entertaining, as I spun by about a dozen people walking and another dozen drunkenly zig-zagging across the road. That climb really wasn’t bad at all, these poor souls ought to come to Whistler! I could have done without the bumpy pavement. Clearly, I’m a princess. By mile 80, I was ready to sell my bike to whoever offered me $5 and a cold Coke. Goal: Don’t think about my ankle. Aim for a 1:47. Try to look alive. Don’t fry in the sun. Reality: Took a while to find my legs. Managed to nicely negative split this run. 1:52 and change. I’ll give the race this: that was definitely the toughest half-iron run I’ve ever done. Again, I’m grateful we didn’t drive it – it was very, very hilly. But I like hills, so I had that going for me. It took forever though for my brain and legs to engage and acknowledge that we were racing, not just cooling down after the ride. Mile 1: stop to help a woman who crashed her bike about 10 feet away from me in a very spectacular fashion. Amazingly, she walked away with only stitches. I thought she’d broken many body parts. It was one of those scorpion crashes through the air that contort the body in a way that only Cirque du Soleil performers should attempt. I’m glad she’s ok.
Mile 2: Pee break. Seriously? I’ve never done that before. Guess I nailed my hydration on the bike. I contemplated just hiding out in the porta potty because at least in there it was shady. Mile 3: stand around and re-apply sunscreen at the aid station. The lovely volunteer told me I looked like I needed it. Mile 6: Someone handed me a Freezie! I love you, whoever you are. 5:38 and change. Not my best, not my worst. Pleased with some parts, most parts need a lot of work. And apparently, based on how long my transitions took, I could have spent some time doing my nails or taking a nap since I was in there for so long. The long and short? Tough but fair course. Really pretty scenery. Fun road trip. I need more training. Time to sharpen up. Turns out you can’t really step away from racing for 3 years and then go on to pretend like you know what you are doing. Here’s to the next one! Planning started about 25 minutes after Liz , Kelsey and I reunited post-race. That’s how we roll, I guess!